As it turns out, I now have fat hands – or fatter hands, than say what they were Before Blobette. Because as it turns out, the joke about removing my rings almost requiring amputation wasn’t so much a joke as prophetic. I almost took my finger off last night trying to negotiate both rings past my bloated phalanx. It – the bloated bit – got purple and angry-lookin’. It hurt. Welcome to the wonderful world of water retention. I’ve told friends and colleagues for years that Asian women, particularly, get water retention right smack bang in the middle of their faces. Probably from all that salt we eat, who knows. I can’t tell you how many times in Singapore I’ve watched with fascination mingled with horror as a heavily pregnant woman waddled past me with a bulbous nose (usually making a beeline for the shops because it’s airconditioned). In fact, I’d always thought I’d been resigned to look like a circus act by my third trimester. I am now in my third trimester. And suddenly, the idea of water retention isn’t so funny. Fluid retention. After reading at length about it, it suddenly clicks that I’m not suffering from hayfever so much as edema. My already flat nose is getting even more compromised as nasal cavities swell attractively and cause even more blockage. Then again, I sneezed about 700 times over the weekend, which is an unfortunate state of affairs when you have 10kg of baby precariously close to your bladder. Anyway, enough of the visual – I went shopping today. Now that I can’t wear my wedding rings, I decided that it just wouldn’t do to wander the streets looking obviously knocked up, edema-ridden AND abandoned at the altar to boot. Let it be super-obvious that there was a man involved, that said man is STILL involved, that he has a name, and that I wear it. So I wandered out to the Canberra Centre, to my favourite costume jewellery shop (Devine Goddess – the one that stocks the bling as seen in SATC2), and had a look-see for rings. loads of preggers also secretly take the opportunity to find something that looks like they’ve upped the karat count and hired a crazed Italian designer to go silly. I love my rings, and I love Tony – but I still got a tad giggly deciding what my decoy ring was going to be. 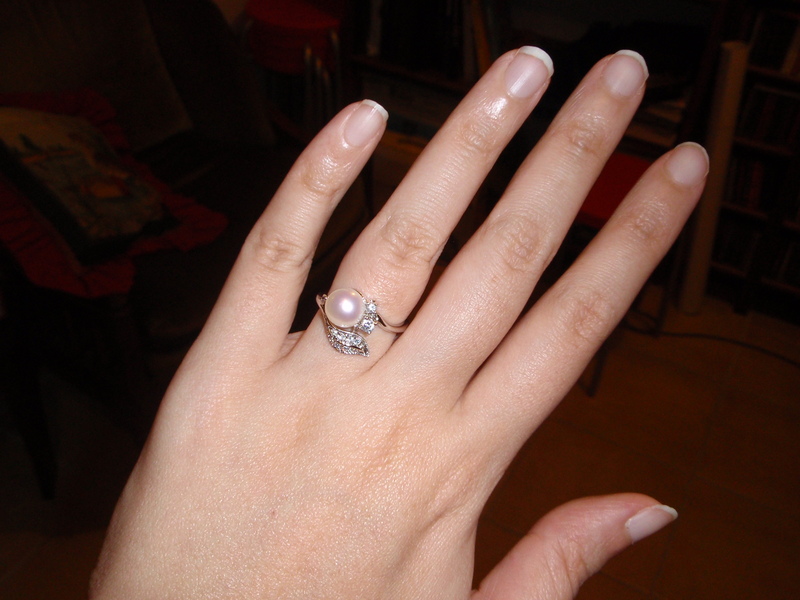 Decided to go for a pearl this time, and even though it really doesn’t look like either an engagement ring or a wedding ring… it’s pweedy. You are a wally!! But I love ya! Yeah… too many other expenses coming up, what with doctor’s bills etc.